It’s Friday and that means fill ins! 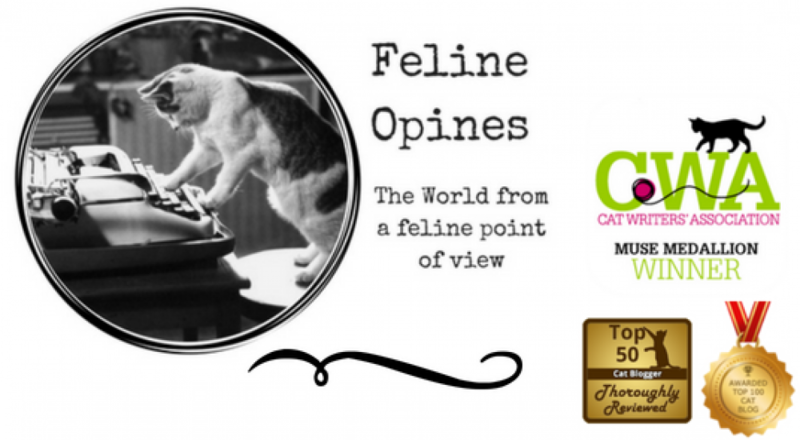 You can join this blog hop by heading over to 15andmeowing or their co-hosts Four-Legged Furballs. If you’d rather just opine about your answers in our comment box, that’s great too! 1. I just survived the “holiday” The Humans refer to as “Halloween”. Oh the embarassment. Oh the humiliation. The Female Human has no dignity. 2. My next project will be to read the instructions before I try to play with the new toy. 3. The sound of the vacuum monster makes me cringe and want to hide. 4. Right now, I am craving a snack but The Humans are walking by me and taking no notice of my presence in front of the pantry doors where the snacks are kept. This entry was posted in cat behavior, Cat blogs, Cat Health, Cat writers, cats, Pet blogging, shelter cats and tagged cats and halloween, cats and toys, cats and treats, cats and vacuum cleaners by Feline Opines. Bookmark the permalink. You do deserve a treat, and i hate the sound of vacuum monsters, too. Unfortunately, i have to use them every day, they are loud and annoying. Dang, you really are being ignored on that treat thing! Oliver, you do the same thing our cats do…they refuse to look at us when we are embarrassing them! Heck, Angel stuck a pointed claw right into The Hubby’s shoulder, to remind him that SHE is in charge…hehehehe! Thank you for joining in on the Friendly Fill-Ins, Oliver! We happen to think your human looked purrfectly festive on Halloween!